The history connects the past and the present in our minds. A study of history is essential for every professional, scientific and technological discipline. Such a study is all the more required for the pharmaceutical discipline, which encompasses a wider spectrum of specializations, making pharmaceutical history more interesting and enjoyable. It fell to our lot to pioneer publishing tomes on various aspects of modern pharmaceutical history of our country. We are beholden to Professor Harkishan Singh, a doyen of pharmaceutical academics and world-ranking pharmaceutical historian, for patronizing the Vallabh Prakashan to publish his works on the subject. By now there have been published nine volumes, thus creating rich knowledge base for easy access to all keen on knowing about different facets of our pharmaceutical heritage. A concise version Pharmaceutical History of India has been especially brought out for the purpose of serving as a textbook. Its perusal may even whet the appetite of the general readership for more, which the other detailed accounts provide. The availability now of all the reading material should make it possible to introduce formal courses of education for spreading awareness about our pharmaceutical inheritance. 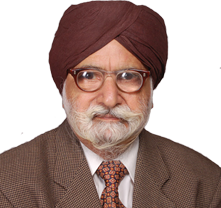 Padma Shri awardee Professor Harkishan Singh is a prominent medicinal chemist and a science historian. He has worked with the premier institutions like the Banaras Hindu University, Panjab University, and University of Saugar at home, and abroad at the Universities of London, Maryland, and Mississippi. He has been a National Fellow of the University Grants Commission. Presently, he is Professor Emeritus at the Panjab University. He has been intimately involved in the working of several professional and statutory bodies. Professor Singh's areas of history research pertain to pharmaceutical and related developments in India during the last two centuries. His publications have been very well received. His standing as a historian has been recognised in his election to the Académie Internationale d'Histoire de la Pharmacie. He is conferred with the Padma Shri award for his contribution in the field of medicine by the President of India in 2017.